孙小斐, 乔玉辉, 孙振钧, 王冲, 李花粉, 岳士忠. 富硒蚯蚓的培养及其硒富集作用研究[J]. 农业资源与环境学报, 2014, 31(6): 570-574. SUN Xiao-fei, QIAO Yu-hui, SUN Zhen-jun, WANG Chong, LI Hua-fen, YUE Shi-zhong. The Cultivation and SeleniumEnrichment of SeleniumEnriched Earthworm[J]. Journal of Agricultural Resources and Environment, 2014, 31(6): 570-574. Abstract:As a bio-carrier, Eisenia fetida was fed with cow dung that added with sodium selenite in order to transfer inorganic selenium(Se) into organic selenium. Targeting on survival rate and selenium content, the effects of five Se concentrations(0, 20, 40, 60, 80, 100 mg·kg-1) and four cultivation periods(15, 30, 45, 60 d)on earthworm growth and Se contents were investigated. The cultivation method with high survival rate, high Se content of earthworm and short breeding time would be screened out. The experimental results showed that the earthworm survival rate decreased and the Se content in earthworm increased with the increase of Se application and the extension of breeding time. 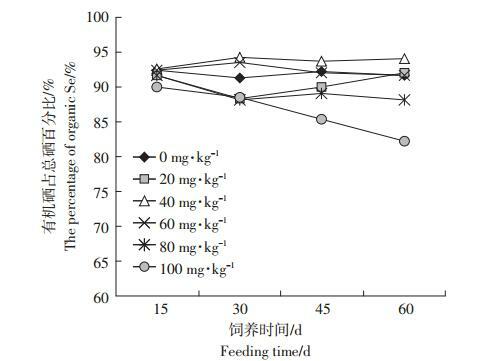 The most optimummethod was screened out when the Se concentration was 80 mg·kg-1 and the cultivation period was 45 days, Se content in earthworm was up to 33.25 mg·kg-1. Yang Y, Zhang S Z, Wen B. Accumulation and speciation of selenium in plants as affected by arbuscular mycorrhizal fungus glomus mosseae [J]. Biological Trace Element Research, 2011, 143(3): 1789-1798. Pezzarossa B, Remorini D, Gentile M L, et al. Effects of foliar and fruit addition of sodium selenate on selenium accumulation and fruit quality[J]. Journal of the Science of Food and Agriculture, 2012, 92(4): 781- 786.